In this page, we will learn using Gradle in our project from scratch. 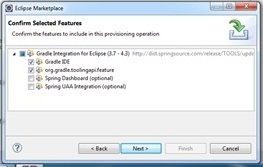 We will see how to install plugin in eclipse for Gradle and installation of Gradle binary in OS. We will see how to write Gradle script to create JAR and WAR. We will run the Gradle command to configure classpath in eclipse. We will see all these step by step. 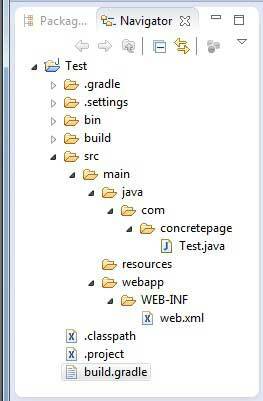 In our demo to run a simple java program building with Gradle , we are using below softwares. 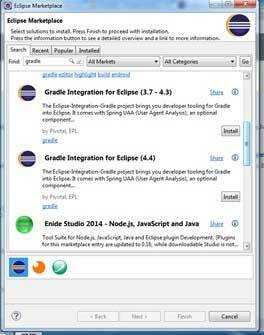 To integrate Gradle in eclipse go to Help->Eclipse Marketplace and search for Gradle. Install Gradle Integration for Eclispe. Find the below figure. Select the required software and click next. Follow all the steps, restart the eclipse and go to Window -> Preferences . 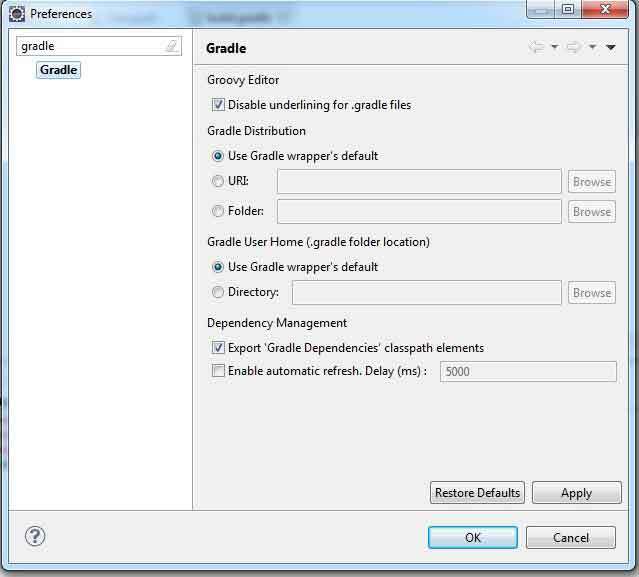 Search for Gradle, if found it means you have successfully installed the Gradle plugin in eclipse. You also need to download Gradle binary and install into your system. Find the Gradle binary from below location. After installation, set path variable for bin location in system environment. Create a java project and create directory structure as below and set src as below. In the root directory of project, create build.gradle . And write below script. To create WAR, we need to write below command in our script. You can set your jar repository. BY default, Gradle picks jar from Maven Central. Suppose we need to provide common- lang and log4j dependency in our project. Then we add below code in our Gradle script. To run the build.gradle, open the command prompt and reach to the root directory of your project. And run the below command as below. Gradle provides command to configure classpath of the project for all jar dependency. In the Gradle script the below line is required. Check the project .classpath and you will see that all dependency JAR has been configured. Now we will create a simple java program to test. We are using common lang and log 4j class to test our gradle build. To create a JAR you can use below Gradle script.